Tool selection is often a difficult process. Manufacturers are keyed on branding, and often use brand terminology to describe what may (or may not) be useful product features. As a customer, a lot of my efforts are spent trying to interpret this information, and cut through the terminology to get to a head-to-head comparison. Most retailers repeat brand product descriptions verbatim, but McMaster-Carr does customers the service of stripping brand copy and providing only the relevant product features. They even go a step further, formatting those features consistently across product lines. 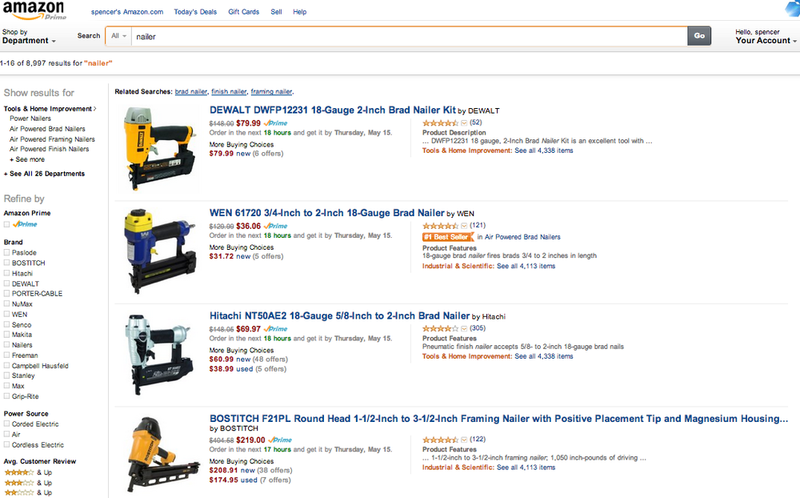 Amazon's results show four products. Customers can see the brand name, a large color photo, pricing, consumer (star) ratings, shipping availability, and one product feature/description. McMaster, on the other hand, shows eight products (plus two accessories). Each product has nine features, a price, and a detailed description - including a wide range of associated products (mostly nails, in this case). Amazon seems to think that what I really care about is the color of the tool and when it's available. McMaster gives me real product data, and their global shipping policies (which are a worth a thousand words unto themselves) give me all the information I need to make a timely decision. While Amazon focuses on brand language - both the manufacturers' (who needs the 9-digit alphanumeric part numbers?) and Amazon's ("Prime"; "#1 Best Seller"; "More Buying Choices") - McMaster focuses on what the tool actually does. As a consumer, I want to comparison shop by technical product features, so that I can quickly find the right tool for the job. Brands are beside the point. McMaster commoditizes products, reducing them to the features & methods they use to solve my problems. Added on October 18, 2013 by Spencer Wright. From Fast Company's recap of their pre-Apple interviews with Apple's new consumer experience chief. Emphasis is mine. Everything we’ve done is counterintuitive to traditional selling organizations, with their traditional training. My dad used to always say that he could teach anything but he couldn’t teach how to feel. That’s the hardest part when you have 11,000 people: How do you teach them to feel how we feel? When I first started, we had no training programs--none of that. We had to put in world-class sales and service training programs. The thing is, I don’t want to be sold to when I walk into a store. I want to be welcomed. The job is to be a brilliant brand ambassador. Everybody is welcome. Don’t be judgmental whatsoever. Look them in the eyes. Welcome them. ‘How are you?’ Don’t sell! NO! Because that is a turnoff. So how do you hire all these amazing people and put them in a world-class retail setting and then say, ‘But you’re not allowed to sell’?! How do you put this whole digital team together and say, ‘But we are not doing any direct marketing to sell to you!’? The digital guys look at you like you’re nuts. But no, no, no, no, no. What we have wanted to do is build an amazing brand experience and an amazing way that people can engage with the brand. Then it will naturally happen. And then I don’t care where they buy. I only care that they buy the brand. Traditionally, wholesale is wholesale. Digital people are incentivized to drive digital. And store managers are interested in the store. We blew that all up. I said, No, no, no, store manager in Detroit: You’re responsible for digital too. You’re telling me nobody in Detroit is shopping online? Wrong! Now London, for instance, every week has to report their online traffic and their offline traffic and what was their crossover. I hired a chief customer officer who came from Lloyds who built us a huge insights and analytics department. We put in traffic counters in all the stores, because I could get traffic online but I couldn’t get traffic offline and so I couldn’t get any crossover behaviors. We’ve got ten thousand iPads out there in the stores. And we’ve built this clienteling app. So if you buy in Hong Kong or if you went and bought online or even if you are just window-shopping and have stuff in your basket--we’ll know. Offline stores will be able to see all your behavior online. We are blurring the physical and digital, and it’s not just the retail experience. It is the service. Added on September 27, 2013 by Spencer Wright. Why aren't barbershops tracking customer preferences? I have never, not once, felt confident enough to point at the barbershop haircut charts when sitting down to get a trim. I suspect I'm not alone. I've also never had a regular enough barber to develop any degree of aesthetic understanding and trust. This leaves me in a tricky position. I want to look good, and I want my barber to have some creative input. I want a stylist, really, but without a long-term relationship with my haircutter, that's difficult to establish. It's only recently that I decided to load my phone with photos of haircuts I liked before getting a trim. It was somewhat effective, but it has this basic problem: those guys aren't me. And telling my barber that I want to look like him isn't really true. I want to look like the best version of myself. So. An app that integrates with my barber's POS. When I'm done with my cut - right after they take the stupid mirror and show me my neck (in fact, the app should replace the mirror) - they take a quick GIF showing me from a bunch of angles. It's saved in my customer file, and accessible by my barber when I come in next month. It's something we can discuss and point at - a jumping off ground for experimentation. My haircut becomes a work in progress instead of a one-time gig. For the customer: Consistency. For the barber: The opportunity to develop a long term relationship that can transcend staffing changes. The app becomes a whiteboard for discussing style. Am I missing something? For the right kind of customer and shop, I think it'd be a killer match.